A Jewish knish (kuh-NISH) is a savory single-serving pie filled with meat, potatoes, kasha, sauerkraut, onions, or cheese (and lately spinach and other ingredients) that is baked or fried. It's similar to a British pasty, Mexican empanada, Russian pirozhki, and an Italian calzone. The recipe for this filling was provided by Lloyd Weinstein of Benjie's Deli in Santa Ana, Calif. The knishes can be individually quick frozen on baking sheets and transferred to freezer bags for storage if desired. Note that if you want to freeze the knishes before baking, the instant potatoes in this recipe help to stabilize the filling as it thaws while cooking, soaking up any excess water caused by the thawing. The cream cheese and butter in this dough produces a flaky pastry. In kosher cooking, this would be considered a dairy meal and the dough should not be filled with meat. 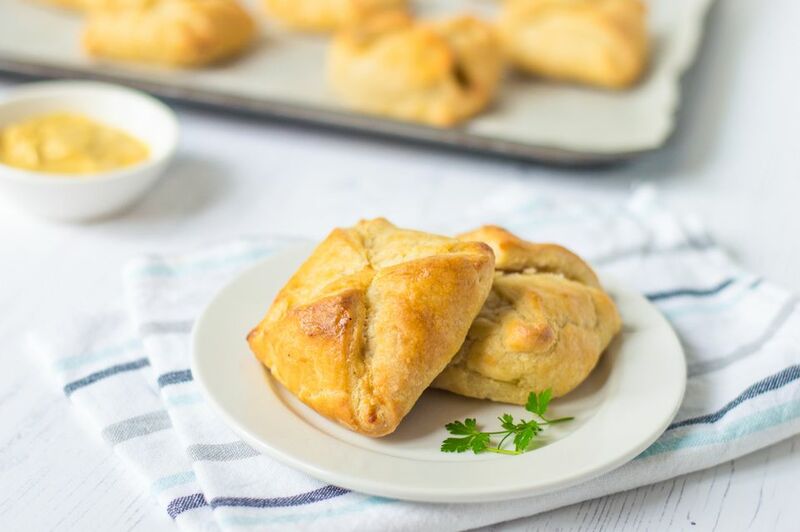 Note: while there are multiple steps to this recipe, this potato knish dish is broken down into workable categories to help you better plan for cooking. In a food processor fitted with a metal blade, process butter, cream cheese, and sour cream until smooth. Add flour and salt and pulse to blend. Turn dough out onto a sheet of plastic wrap. Using floured hands, form into a ball and wrap tightly. Refrigerate at least 2 hours or overnight. In a large bowl, mix together cooked and shredded potatoes, sautéd onions, eggs, instant mashed potatoes, salt, ascorbic acid, garlic powder, Tabasco sauce, and optional cheddar cheese. Mix until thoroughly combined. Set aside. Flour a work surface and place the dough on it. Cover with plastic wrap and let rest 15 minutes. Roll the dough to a 1/4-inch thickness. Using a pizza cutter, cut the dough into 3-inch squares. Egg wash the squares with 1 beaten egg mixed with 1 tablespoon water and 1 optional drop of yellow food coloring. Place two cookie-size scoops of filling on each square. Then fold the ends in as for an envelope. Place knishes on a parchment-lined baking pan and brush with egg wash. Continue with rest of dough and filling. Bake for 20 minutes or until knishes are golden brown on the top and bottom. Serve warm as an appetizer, side dish or meatless main course.